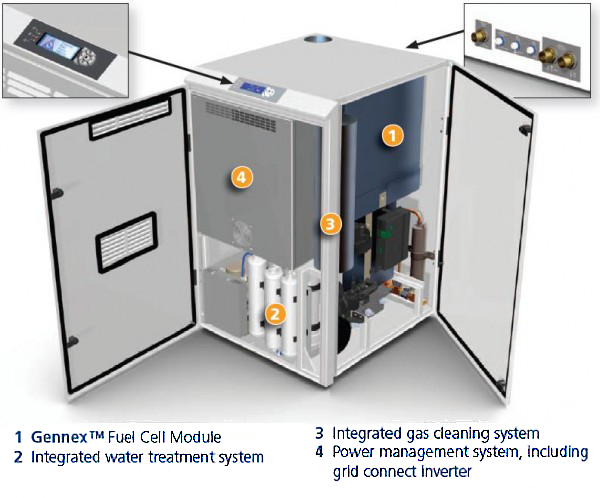 What is the BlueGen microCHP Co-Generation System? BlueGen® is the world’s most efficient small-scale generator. Aimed at both the residential and commercial markets. The BluGen unit is about the size of a standard washing machine and connects directly to your mains natural gas or LPG supply, delivering low-carbon electricity and hot water 24 hours a day. 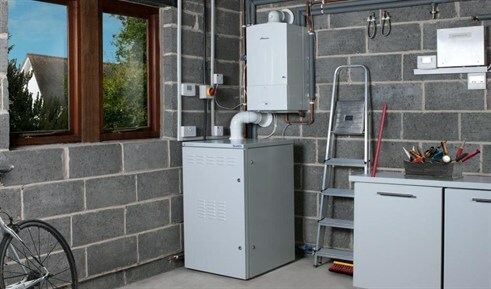 It’s virtually silent, extremely effective and reduces your carbon footprint significantly compared to the operation of a standard condensing boiler. The manufactuer provides an online monitoring system called BlueGen-net where you can see the benefits of the unit live for yourself as it can be accessed from any internet connected device, anywhere in the world. The BlueGen has the highest electrical efficiency (60%) than any other microCHP device currently on the market, producing more electricity and using less fuel as it operates. When the thermal energy from BlueGen is recovered, the total efficiency increases a further 25% to around 85%. How does the BlueGen compare with other microCHP devices? Typically, BlueGen produces over 13,000 kilowatt-hours of electricity on-site per year. That’s two or three times more than the average home needs, with any excess electricity exported to the grid enjoying the FIT and Generation tariff for 10 years. BlueGen’s optional heat recovery system also generates domestic hot water, producing up to 200 litres of ‘free’ hot water per day – ideal for commercial operations or kitchens and bathrooms. BlueGen’s high electrical efficiency means it’s cleaner, with carbon emissions substantially reduced compared to grid power alone. BlueGen even has lower carbon emissions than combined grid and solar Photovoltaic (PV) power. Energy generation all day and night 365 Days a year, whatever the weather. The BlueGen unit generates electricity all year round, rain, wind or shine, providing a constant, stable source of clean electricity when compared to renewable energy. Combined with solar panels, BlueGen’s electricity output can be increased or decreased to suit specific needs. For example, its output can be increased during the evening when solar panels aren’t producing electricity and decreased during the day when they are saving fuel and optimising the whole process. Next generation technology, available to the UK early 2015. The popularity of fuel cell technology is growing rapidly and BlueGen is at the forefront. Fuel cells represent a clean energy future, where energy efficiency is paramount and producing your own electricity is standard. BlueGen allows end users to achieve this, using technology developed through world leading research and practices.